Make it happen. Make it better. We can help. 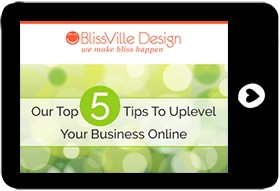 You are ready to finally launch your website, or take your current online presence to the next level, and you’re not interested in DIY-ing it! You’ve either been-there-done-that and know how much of a pain it is, or creating your own website and trying to figure out the ever-changing landscape of online marketing and social media sounds like the 7th layer of hell to you. You’re ready for professional website design and marketing support that allows you to focus on what’s important – your business. BlissVille Design has been key in transforming my vision of being a life coach into a reality. I initially tried to create my own website, but it was endless hours of work and frustration. I am so glad that I decided to invest in my company and allow BlissVille Design to build my website for me!! You’ve come to the right place. You can take a deep breath now. At BlissVille Design, we LOVE what we do, and we know that you’re passionate about your business too. We believe that the best use of your time and energy is in building and growing your business, not in trying to navigate website code or Twitter settings. That’s our department. We’re passionate about web design, business development, social media, and marketing. Whatever your passion may be, we can help you bridge the gap from passion to results. As entrepreneurs ourselves, we understand the unique challenges and benefits of going it alone. We work with a trusty team of strategic partners to meet all of your web design and marketing needs, and we welcome any challenge, large or small. Regardless of the size or budget of your project, we believe that we can add serious value to your business while making your life a little more blissful! Your service. Your product. Your message. Let’s get it out there. Rayna Cooper (formerly McInturf) is a self-professed geek, artist and entrepreneur with a diverse background. One of her proudest accomplishments is the co-creation and development of a successful alternative fitness company, Hoopnotica Inc., which grew from her teaching and performance career as a hoop dancer, that has been featured by top media sources such as Time Magazine, The TODAY Show, Good Morning America, Vogue, Daily Candy, The Wall Street Journal, Forbes, Entrepreneur and The New York Times. Prior to becoming an entrepreneur, Rayna managed technical support for several educational institutions. So if you find technology even a little frustrating, you can count on her to help you through the rough spots with a seemingly endless reserve of patience and a willingness to educate. As an entrepreneur, Rayna knows the process of developing a brand and products from nothing but an idea. She utilizes this experience to help other entrepreneurs follow their passions and sidestep pitfalls along the way. The only thing Rayna loves doing more than geeking out on a website build is helping others succeed at doing what they love. Rayna honed her website design & dev skills over the past ten years while building three of her own businesses. She has developed websites for her own companies and others, and managed teams through larger website development projects. She loves coding as much as creative design and brings this unique right brain/left brain balance to every project she works on.